THE WRITING BUDDHA - Opinions | Books | Movies: Forget Me Not, Stranger by Novoneel Chakraborty (Book Review: 3.5*/5) !!! Forget Me Not, Stranger by Novoneel Chakraborty (Book Review: 3.5*/5) !!! This whole first week of May would be remembered for "The Stranger trilogy" written by Novoneel Chakraborty for me. It has been one of the best series I have ever read and enjoyed thoroughly. Novoneel has taken a drastic jump in his writing career and impressed his fans a lot with this one. The idea of dividing this story into 3 books has been an interesting one as it helped him gain few more readers while readers enjoyed thinking about who the stranger might be and what would happen next with the protagonist- Rivanah. 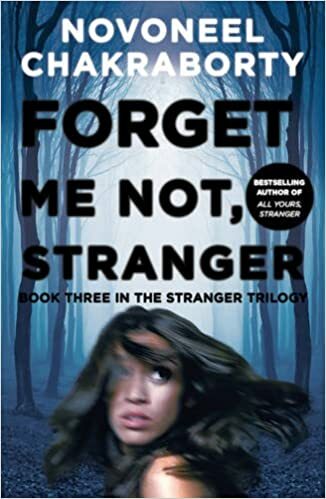 Specifically, talking about the 3rd and the last book in the series named "Forget Me Not, Stranger", it has been written in a surprising synchronization with the first two books which makes it easy for you to read it in fast pace since the first page itself. I would specially like to appreciate author for not getting into the complex way of presenting this story as a trilogy. In fact, he made the story simpler for his readers with the help of distribution of it into 3 books. Kudos! The first half of the book is interesting as you find Rivanah and Danny still in love and enjoying their relationship. Stranger is still troublesome for her and have now started to do more heinous activities with her. But he is now ready to reveal himself and meet her soon. This makes it a page-turner and you will find yourself finishing this book quite before than your average reading speed. The book explores the characters from old books quite nicely and the new characters also become familiar to you within few scenes itself. The involvement of Rivanah's parents in the mystery is also an added value as you know that something big is about to get disclosed in next few chapters. This book is also narrated well keeping the same curiosity in the reader for knowing who the STRANGER is. But coming to the drawback of this book which is really a huge one:- The last chapter. Yes! The last chapter when the stranger is finally revealed just depresses like anything. You just can't introduce a new character in part 3 who has nothing to do with Rivanah in the first 2.5 books and announce him as Stranger for whom we waited since the first page of the first book. This whole concept of secret society in the end is not what we awaited for. Also how the character kept eye on Rivanah 24*7 and how he managed to run away each time after trapping her isn't explained which takes this book down quite a level indeed. I am very disappointed not with the author but with myself that I have not liked this book as much as the first 2 books because I seriously wanted to get crazy about this series. Anyways, Novoneel Chakraborty has emerged out to be a great writer with this one and there is no looking back after this. I give the last book in the series 3.5* out of 5.